New Moon and Meteors Coming Up! The Geminid Meteor Shower should peak late Sunday night. Watch toward the east after 9:00 pm. It's always best to get away from city lights, if you can. New Photos Show Apollo 11 Landing Site! Apollo 11 launched 40 years ago yesterday, July 16. Here are pictures of the lunar landing site taken by the Lunar Reconnaissance Orbiter. Read this article from Space.com. Apollo 11, the first mission to land men on the moon, launched 40 years ago today. 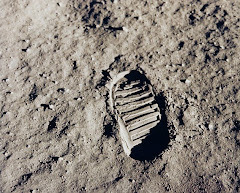 This photo gallery at Space.com looks back at the historic mission to the moon. Relive each Apollo mission with video, photos and a unique animated comic. The Apollo 11 mission feature will be released on July 16, 2009. During dawn Saturday and Sunday, the Pleiades, Mars, Aldebaran, and dazzling Venus form a mirror-reversed letter "L" in the east during early dawn, as shown at right. And the waning crescent Moon comes passing through.